Nik Bärtsch, Eve Beglarian, Oscar Bettison, Glenn Branca, Ty Braxton, Nick Brooke, Jeffrey Brooks, Zack Browning, Mira Calix, Jace Clayton, Anna Clyne, Dan Deacon, Bryce Dessner, Sussan Deyhim, James Fei, Joshua Fried, Fred Frith, Ben Frost, Yoav Gal, Annie Gosfield, Erdem Helvacioglu, John Hollenbeck, Cynthia Hopkins, Jóhann Jóhannsson, Scott Johnson, Karsh Kale, Carla Kihlstadt, Glenn Kotche, Lukas Ligeti, David Longstreth, Annea Lockwood, Alvin Lucier, René Lussier, Keeril Makan, Ingram Marshall; Miya Masaoka, Paula Matthusen, Marc Mellits, Kate Moore, Thurston Moore, Virgil Moorefield, Nico Muhly, Tristan Perich, Joshua Penman, Dan Plonsey, Richard Reed Parry, Ed Ruchalski, James Sellars, Caroline Shaw, Zhang Shouwang, Matthew Shipp, Jim Thirlwell, Anna Thorvaldsdottir, Toby Twining, Juan Felipe Waller, Daniel Wohl and Pamela Z. 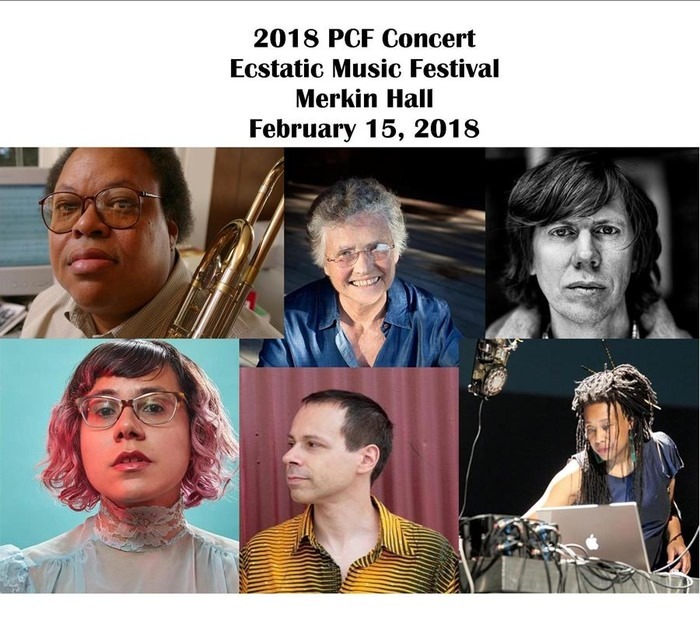 THIS YEAR'S annual Bang on a Can People's Commissioning Fund Concert on the Ecstatic Music Festival features world premieres by George Lewis and Angélica Negrón, plus a new look at “historic” PCF-commissioned pieces by Pamela Z, Annea Lockwood, Lukas Ligeti and Sonic Youth’s Thurston Moore. This concert will be a New Sounds Live co-presentation hosted by WNYC’s John Schaefer & streamed live on streaming station New Sounds. Bang on a Can’s People’s Commissioning Fund (PCF) is a radical partnership between artists and audiences to commission works from adventurous composers. February 15, 2018 at Merkin Hall!